I was really pumped to spend the weekend at the Salmon River. I had tied new flies, bought a switch rod, and loaded the car. My anticipation was stratospheric. Unfortunately, a few hours before waking up for the long drive, the powers-that-be unleashed high flows from the dam. I already was beyond the cancellation deadline for the hotel, and so, went ahead with the five-hour drive, wondering what I would find. 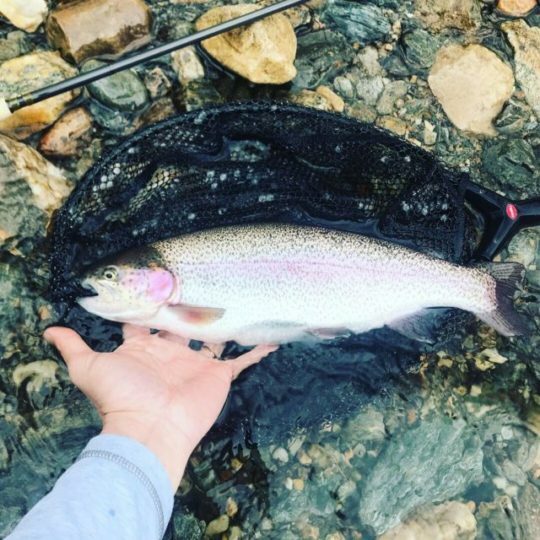 Well, the river was not fishable. The flows were extremely high and strong. 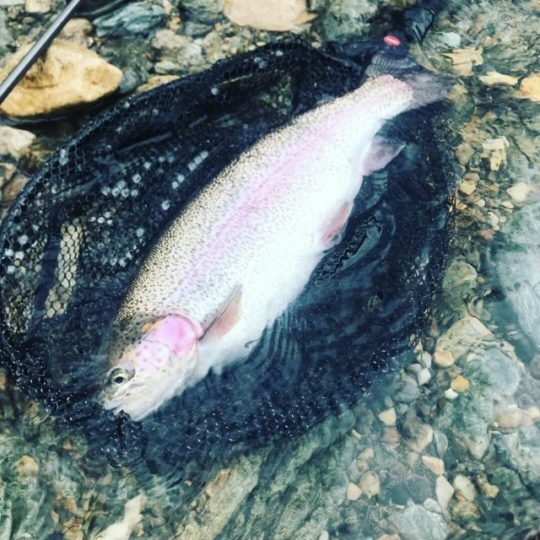 I instead fished some of the creeks and was skunked. The hotel was sold out, and I spied quite a few glum anglers. That night, it rained and rained. There really is something about steelhead fishing. It never seems easy! Thankfully, fellow blog writer Dan Wells kindly pointed out a few creeks that tend to clear first after a storm. He has been incredibly generous, providing detailed and thorough advice, given his intimate knowledge of the Salmon River and its tributaries. I woke up early the next day to hit the water. Unfortunately, the parking spots already were overrun with anglers at an absurdly early hour. At one dirt lot, you couldn’t fit even one more car. I went for the least-crowded creek I could find, and that also was a zoo, but I at least could get to some decent water. I was skunked. Moreover, fishing elbow-to-elbow didn’t feel like vacation to me. You fish your 15-yard stretch and are fearful to move, lest someone else swoops in. I decided to bail. I drove by other creeks, but they all looked like torrents of chocolate milk. It was time for Plan B. I decided to fish the Deerfield. Fortunately, the hotel let me cancel the rest of my stay without a financial penalty. It wasn’t something they had to do, and I was grateful. I jumped in the car and drove the four-plus hours to the Deerfield. My back really started to hurt, as it was a lot of driving over two days. The water there also was high, but there was no horde of anglers. Open water! And, my luck turned. 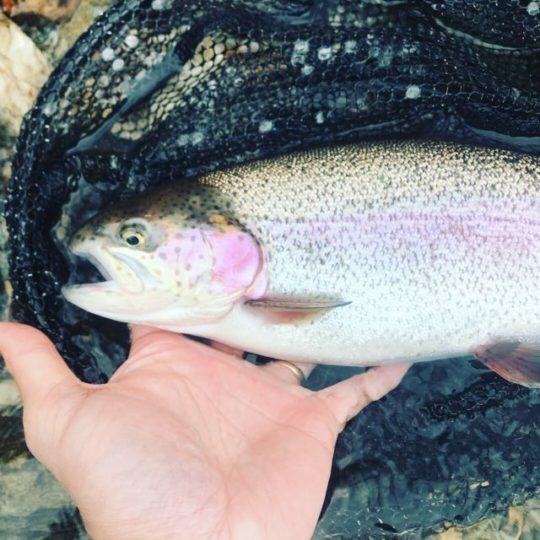 I landed many rainbows, and many fought very hard. Some were quite fat. There were so many fish that I actually felt embarrassed, as other anglers had reported zero hits all day. Trust me, guys, I know the feeling. Honestly, I haven’t been that grateful to see stockies in a long time. I happily fished until dark, which is something that I rarely get to do. For dinner, I headed to North Adams. I love that town: a quick drive to and from the Deerfield, great pubs and restaurants, and a chill vibe. It is adjacent to Williams College; there’s a great deal of energy and youth in the town. I’ve not enjoyed staying in Charlemont. There are very few dinner options, and the accommodations aren’t great. 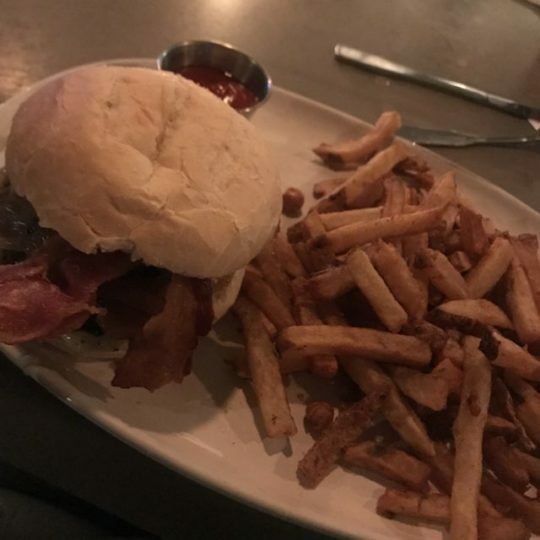 Dinner was a ridiculously good bacon cheeseburger at Public Eat + Drink. As I ate, I looked for lodging. You really can do a lot with a smartphone and WiFi. I went to bed feeling tired but full and happy, visions of that evening’s trout dancing in my head. I wondered what the next day would bring. Good job making lemonade out of lemons. Did you have your nymphing rod with you or relegated to using the switch rod? I haven’t fished the Deerfield in eons cause the Farmington or Housatonic is a closer trip. Thank you! I had four rods loaded in the car, and so, I fortunately was good to go. Good to see your plan C worked out. The Deerfield was on the back of my mind this weekend. Kinda funny how things work out! I should have texted you! Good call on bailing up north and fishing the Deerfield. Glad the action was good there, but maybe those weren’t stockies. Perhaps holdovers that have been feeding very well with all the food getting washed in the river with relentless rain. Regardless, good to get action. Thank you! After all the suffering at the Salmon River, it felt good to see fish and almost no anglers!